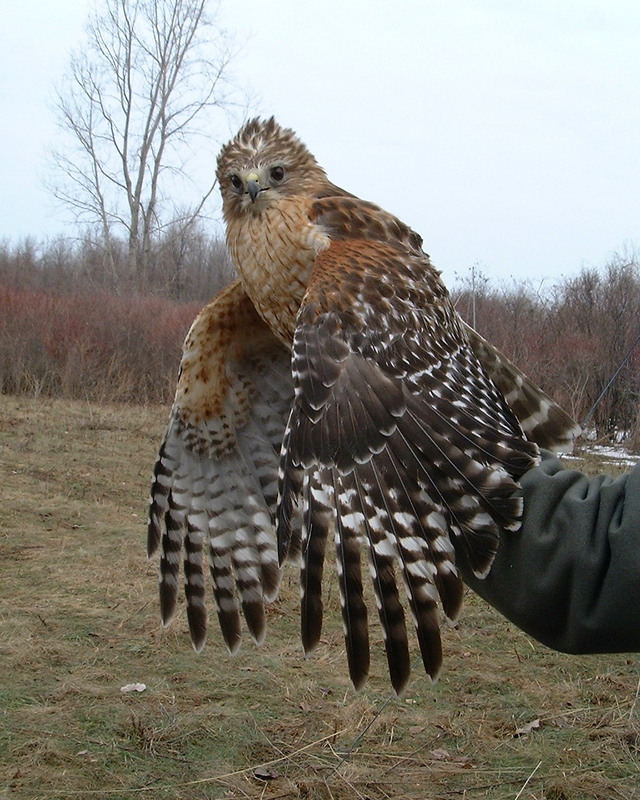 Before Earth Day (1970) and wetland protection laws, the Red-shouldered Hawk (Buteo lineatus) was being extirpated from most of Northeastern North America. As various endangered and threatened state laws came into place, this species was added as Threatened. Nesting in wetland forests brought about those listings. 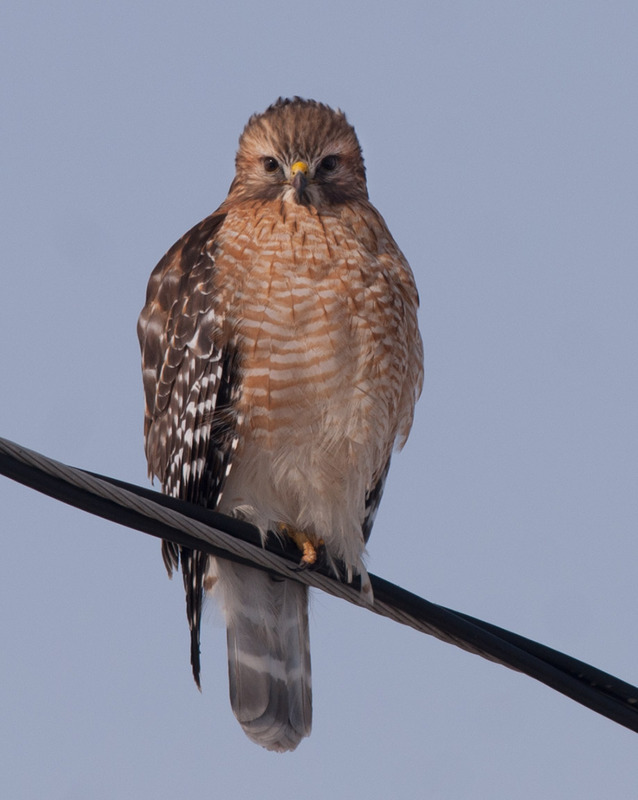 In Massachusetts, many of the first strip and enclosed malls were built after destroying Atlantic Whitecedar Swamps along the Route 128 corridor: prime real estate for the Red-shouldered Hawk. This species has recovered in the Northeast — US and Canada — but not to pre-WWII populations. In the west, the birds are much more richly colored and marked (Bl.eligans). While in the SE, the birds are quite pale (Bl.extimus). 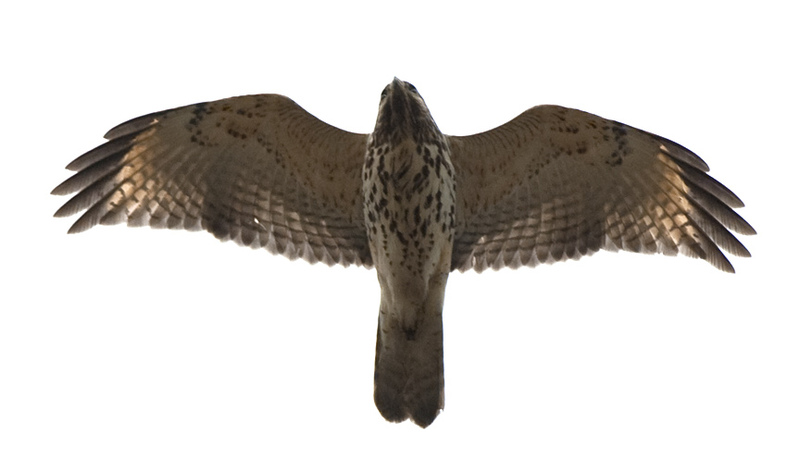 In contrast, here’s an adult female in migration. In much of North America, this species is non-migratory with pairs staying on territory through the winter, with the young moving out. But the northern birds—in most of New England and the rest of the continent north of that latitude—migrate. We are seeing more wintering adult males to the north, with a larger proportion of the late March and early April migration consisting of adult females. Juvenile Red-shouldered Hawks are tricky to identify, especially perched. I receive images of questionable perched hawks from many states and provinces. Perched birds seem to give birders problems. 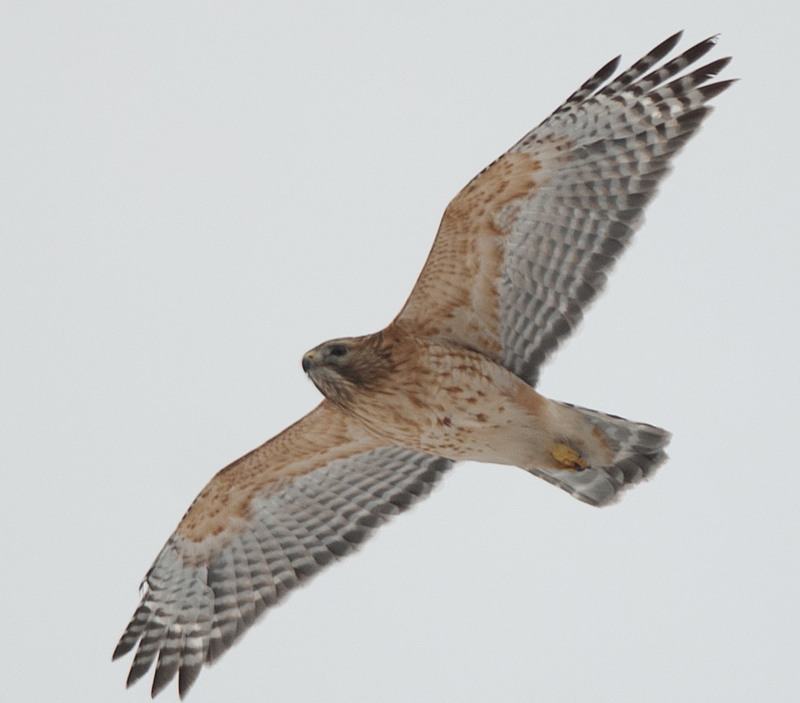 This species is most often mistaken for an accipiter species, but Redtails and Broad-winged Hawks are also early choices. This is a fresh-plumaged dispersing juvenile with an unusual clear throat area, but showing the pale crescents very well. Both juveniles show a finely banded tail with a wider subterminal band. 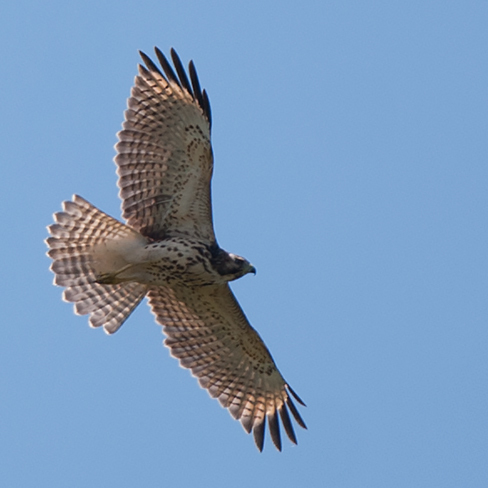 Note that the adults above and these two juvs exhibit well-delineated and dark wing tips. I am occasionally sent an image like this one: a lightly marked adult Shoulder photographed somewhere in northeastern North America. The sender wants me to confirm that it is the Florida subspecies; sorry, folks. It’s not (and these images are always taken in spring). Red avian pigmentation wears/wades quite easily. This is a simply a worn bird, like this adult female. And last, back to the issue of wintering birds in northeastern North America. This is a situation I have been interested in for the last twenty winters plus. Hundred of migrating birds of this species are counted across the Northeast in both spring and fall. When observed singly in winter, these have always been adult males… I have requested or received dozen of images over the years. 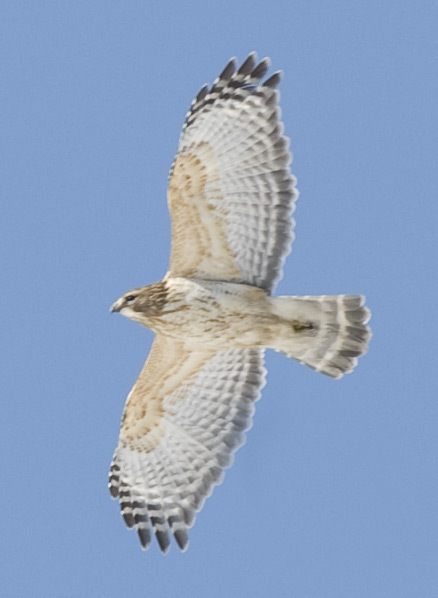 I had such a bird in my eastern Massachusetts backyard, but my image is too small for showing here. This entry was written by whyevolutionistrue and posted on September 22, 2018 at 7:30 am and filed under birds, photography. Bookmark the permalink. Follow any comments here with the RSS feed for this post. Both comments and trackbacks are currently closed. In Mass, southern NH there has been a huge population burst of grey squirrels and many reports of highway carnage – dense covering of corpses hit by cars. Sad for the rodents but may prove to give a food boost to crows, hawks as we go in to cold weather. Evidently there was a plethora of mast last year leading to a food glut and overpopulation. Nature manages – though I wouldn’t call cars and highways “nature-made”. As an aircraft designer, the picture of the young male with missing primary feathers on his right wing is interesting. The poor guy has to adapt aerodynamically to the loss of lift and extra drag. He naturally wants to turn right. His tail might appear to be deflected slightly left to compensate but the angle of the photograph makes it hard to discern. If your 737 came back from a flight with that much wing missing, it would be grounded. Lovely photos! Thanks for sharing. I like the delicately patterned breast feathers. And quite a bit of variation amongst the ages and sexes. These are my favorite local hawks. I feel lucky to have a breeding pair who count my yard as their territory although the local songbirds are not as thrilled…or lucky. Earlier in the year I had one swoop over my head, land in the maple tree behind me and pluck out the robin chicks from a nest, ignoring the parents completely. Thanks for the great photos and learnings. 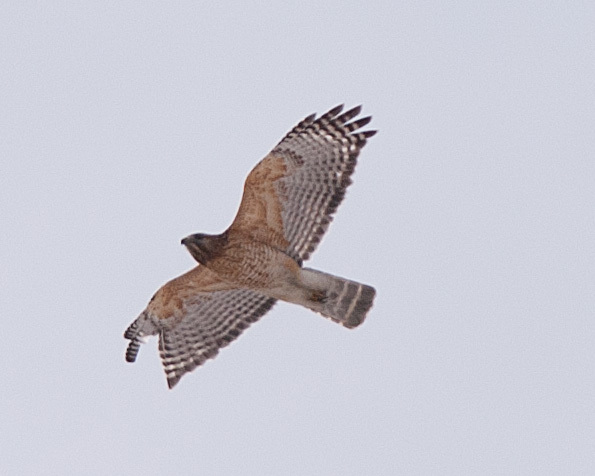 As a relatively inexperienced birder, I find the hawks quite hard to differentiate. Thanks for the detailed description of this species. Better than any field guide. 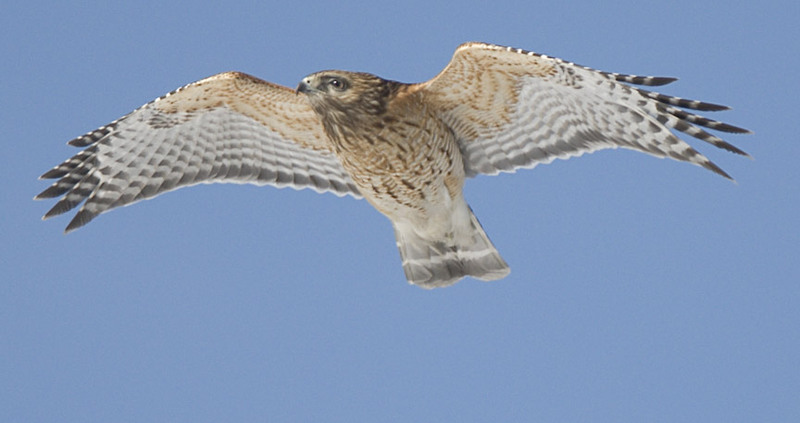 Get yourself a hawk specific guide by Brian Wheeler… or Jerry Liquori. Brian’s new books — one east, one west — hit the shelves in June 2018! Lig’s “Hawks from every angle” is older but available. Excellent images! I’d enjoy the small one as well.